Regular readers (hello!) may recall that there’s very little I like more than a proper old pub, one of the many things Britain does exceptionally well. In fact, one of the only things I like more than a proper old pub is a proper old pub that does brilliant food. Berkshire has lots of these, tucked away in little hamlets, scattered away from the centre of Reading like electrons orbiting a nucleus, but every now and again you find one tucked away in a town centre too. I had high hopes for The Bull On Bell Street, in the middle of Henley, when I chanced upon it last year. I’d stopped in there one Saturday for a decadent mid-afternoon snifter and been wowed by it; the refurbishment had been extremely tastefully done (all comfy old chairs and lashings of Farrow and Ball), the list of wines by the glass was very tempting and the wintry waft of woodsmoke was wonderful. I wanted to curl up in a chair with a good book (or, better still, a trashy one) and never leave, and I made a mental note to come back and try the food another time. And so, a weeknight in January, shortly after the payday that had felt so long in coming, I did. We wound our way through the bar to the restaurant area at the back, and in doing so marvelled at the sheer size of the pub. It’s made up of two or three generously sized rooms which comprise the bar, but the two rooms at the back for dining were also both really big with beautiful tiled floors. The whole thing looked a bit like a posher, less tired Hotel Du Vin – nicely spaced tables on the right, appealing looking booths on the left, attractively lit with plush banquettes. We took one of those and the waitress handed us the suitably rustic looking menus (printed on rough brown paper, a restaurant cliché which has taken a surprisingly long time to reach us from London). She also brought some bread (with butter, sadly still hard from the fridge, and some oil and balsamic glaze) and tap water (in a nice big jug with a sprig of mint and a slice of lemon) without being asked, which I thought was a nice touch. The menu was also promising. It wasn’t too big that you doubted their ability to cook it all, or so small that you felt hemmed in and without choice. I know you only need to find one dish to eat on a menu to make a place worth a visit but it’s one area where it’s nice to have difficult choices and both of us had trouble narrowing each course down from three or four likely candidates. First things first, though: we ordered some wine from the list I’d found so appealing on my previous visit. Because one of us was driving we were limited to wines by the glass but, even so, the choices were good. The South African cabernet merlot was soft and eminently drinkable (if not the most complex red in the world) but the Chilean sauvignon blanc was lovely – zesty and very slightly sweet with hints of peach (it reminded me of a viognier, one of my favourite whites). Neither of them cost more than a fiver. If you stopped reading there, you’d probably reach the conclusion that I’d had a fantastic evening. And, if I’d left the restaurant after the wine, I probably would have done. Regrettably though, however nice your furniture or tasty your wine, a restaurant stands or falls on its food and – for all the superficially promising signs – food turned out not to be the Bull’s strong suit. The starters were both squarely on the border between underwhelming and downright disappointing. 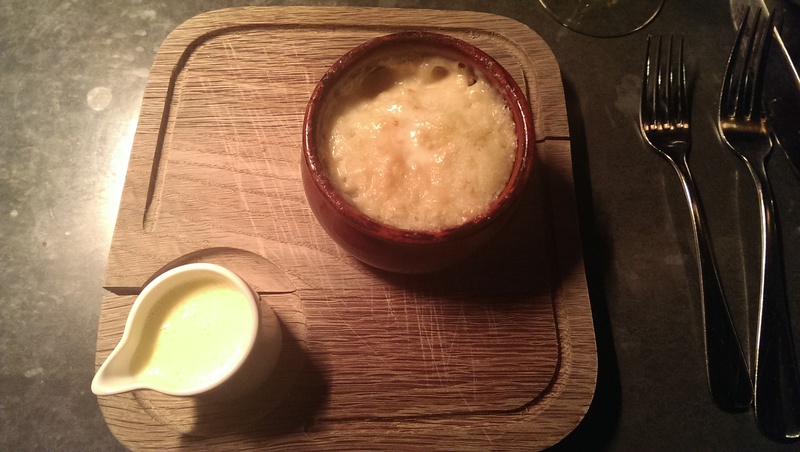 The “smoked haddock pot, rosemary and garlic” was not at all what I expected. I thought it was going to be a type of potted haddock affair, all butter and spices. 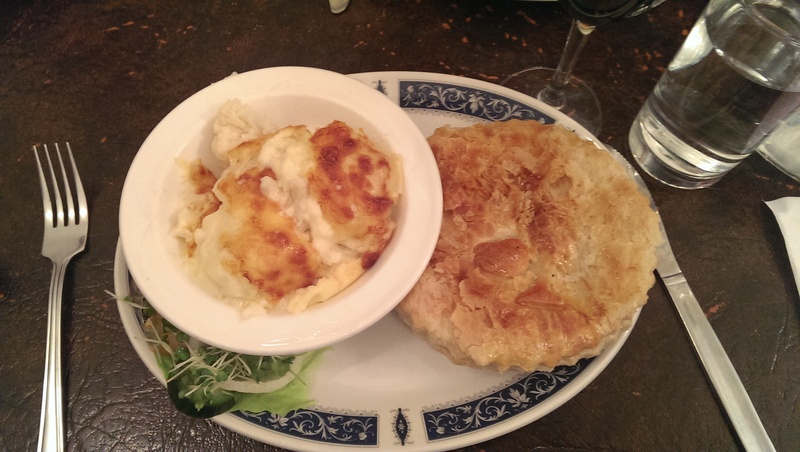 Instead, I got a miniature fisherman’s pie, with a thick layer of haddock, mashed potato and a cheesy topping. There was no sign of rosemary or garlic anywhere, or indeed any seasoning. Or flavour, save for the smokiness of the haddock. The board (it’s always on a board these days, isn’t it?) had a little white jug with a cream coloured sauce in it. I dipped the tines of my fork in to try and taste it and it tasted of nothing. When I asked the waitress to remind me what it was she revealed it to be “butter sauce”. No sign of the rosemary or garlic there, either, more beurre blank than beurre blanc. It was almost too bland to criticise – a fitting accompaniment to the Mumford And Sons, Coldplay and Adele being pumped through the speakers at a volume I wasn’t personally happy with (although, in my case, that’s any volume above “muted”). The other starter was described as “smoked duck ragu” but, when it arrived, betrayed the delicious promise of those three words. I’m not sure how it could be described as a ragu: no tomato, no finely chopped meat, no glorious sticky consistency. 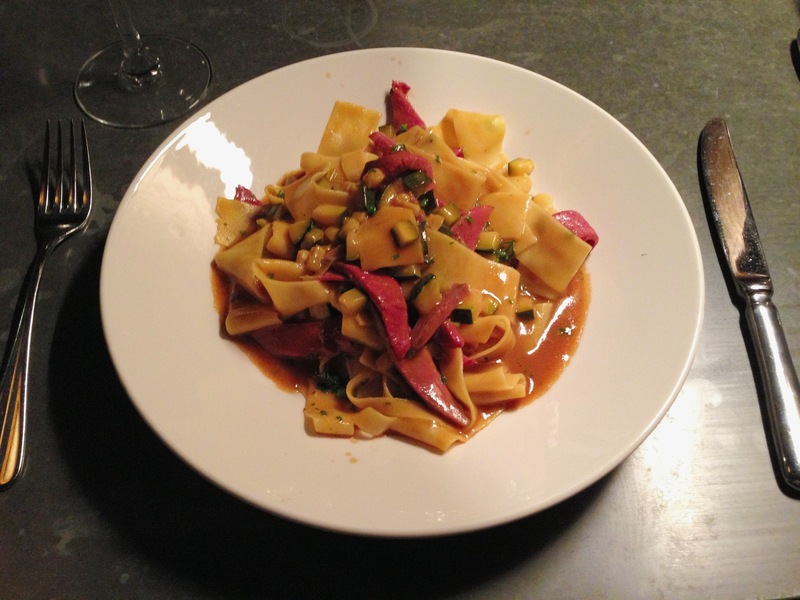 Instead, it was pasta, slices of smoked duck, some kind of bland jus and some finely diced courgettes. It was simultaneously exactly the sum of its parts and miles, miles less than that. When I’d asked the waitress told me the pasta was pappardelle and maybe some of it was meant to be, but some of it was definitely tagliatelle. To avoid any complications which might have been caused by the varying widths, all of it had been boiled into flaccid submission. I’d never really considered having smoked duck in pasta before my meal at the Bull, and I can confidently say that thanks to the kitchen there I never will again. The mains were no better. 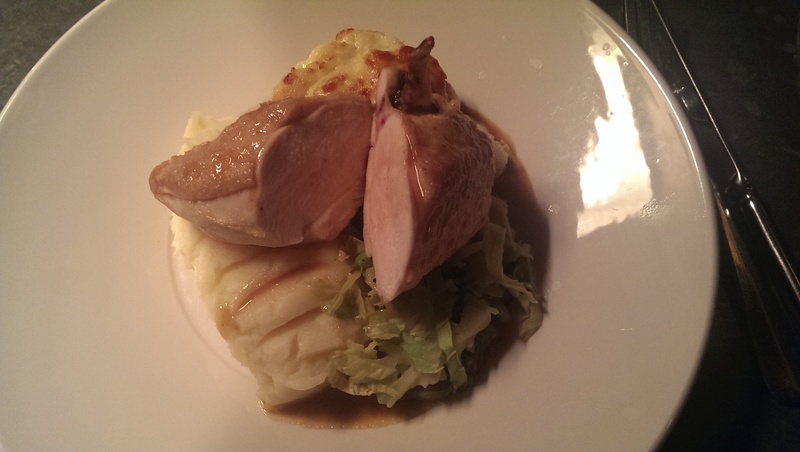 “Pan fried chicken breast, parsnip mash potato, St James cabbage, cauliflower cheese and cream chicken sauce” was pretty much exactly that. The chicken (as you can see from my picture) was massive – I think it had been working out – with a limp skin and no signs of any seasoning. The cabbage was nicely cooked, in fairness, and did indeed have creamy sauce but it didn’t taste of chicken. I’m not sure the chicken did either. The parsnip mash potato was bland and lumpy, neither mashed nor containing any discernible parsnip. All in all, the overall effect was that of eating average food with a heavy cold: nothing tasted of anything. I should exempt the cauliflower cheese from that criticism, because it was terrific – the cauliflower cooked but still firm, the sauce rich and cheesy with a delicious slightly chewy crust on the top. But it wasn’t enough to redeem such a forgettable dish. I didn’t finish it: there didn’t seem any point, when every mouthful was the culinary equivalent of the One Show. The other dish sounded interesting: seared salmon with roasted fennel, chestnut mushroom, salt baked celeriac and watercress. What turned up, as so often that evening, was anything but. It takes real skill to cook salmon so it’s still slightly pink but the skin is salty and crispy, and on this evidence it’s skill that the Bull’s kitchen just doesn’t possess. Again, there was no real sign of seasoning at all. But worse still, the vegetables were woeful. I did catch a bit of mushroom, and a plenty of watercress, and some celery – quite a lot of celery, in fact – but the salt baked celeriac and fennel were harder to find. I got an occasional sliver of celeriac, a momentary flash of fennel, but in reality it was almost as if the kitchen had put just enough of each in there to tantalise you with what the dish could have tasted like if it had been done properly. Again there was no sauce, no flavour, nothing to excite any palate. I’m a long way from the best cook in the world, but if I wanted a badly cooked salmon steak on top of an indifferent underseasoned stir fry even I could knock that up at home, and it would cost a lot less than fifteen pounds. “Shall I bring you the dessert menu?” said the waitress, taking away the two plates and scrupulously failing to notice how much food was left. This was not queried, which sums up the service in general. Our waitress was pleasant enough, although she got increasingly brusque as the restaurant got more and more busy; the place was packed, especially for a Tuesday night (I can only assume most of the diners had heavy colds already). She was however very robotic, something I only noticed when I saw another waiter serving the table opposite us; he seemed to understand what the dishes were and how to sell them, whereas she was just reading off a shopping list. Her lack of enthusiasm made a lot more sense once I’d eaten the food, but by then it was too late. Two courses for two people, including one glass of wine each, cost us fifty-six pounds and two hours of my life. I’m cross that I went to the Bull. I’m cross that I left Reading for such a nothingy meal, and disappointed with myself for picking so badly – because ultimately, reviewing somewhere out of town that isn’t worth going to is almost like no review at all. If I review a restaurant in Reading and say it’s good, maybe you’ll go. If I say it’s bad, perhaps you’ll stay away. But a bad restaurant in Henley? Effectively I’m telling you not to go somewhere that you probably wouldn’t have visited anyway, and this review is all any of us have to show for it. Never mind, I’ll learn from this so as to serve you better: next time I won’t be taken in by beautiful pubs with new paint jobs, and I’ll remember that if a kitchen doesn’t know how to season its food then the whole place is simply not worth its salt. Bhel Puri House is one of those places that it would be easy never to spot, let alone visit; it’s tucked down a side street as part of the George Hotel (opposite the Minster Street entrance to the Oracle) with small windows that make it hard to see what’s on offer inside. It has good credentials, though, as an offshoot of the highly regarded Royal Tandoori. It offers what the website describes as “Indian street food”, which translates as a wide range of small dishes, practically all of them costing less than a fiver. Although it’s open until eight o’clock, it feels – from the menu at least – more like a lunch venue and was doing a healthy trade when I visited on a Sunday lunchtime. The interior is quite basic and a little confusing. It’s a lot better than what was there before (remember Dickens Brasserie? No, I’ll bet that nobody else does either) but the thick black and white striped wallpaper and the basic tables and chairs don’t make it look inviting. Then there are the piles of clear plastic tubs arranged on the counter filled with various dry Indian foods and snacks (I won’t try and guess what they are; I’m far from an expert and I’m keen not to embarrass myself any more than necessary). Were these for diners? To take away? I had no idea, and I didn’t really know if I’d walked into a restaurant or a canteen. Looking at the menu made me realise just how unfamiliar with Indian street food I am. Some of it was familiar, but much of it wasn’t. What’s kachori? What’s sev and would I like it? What’s chaat when it’s at home? I’m ashamed to say that it was one of those menus where, even after you’ve read the description, you’re still none the wiser about what the eventual dish is going to look like, and as much time was spent on Google as reading the options. The other diners (the majority of them Indian) were having no such difficulty, which I took as a promising sign. Ordering here is at the counter (which, again, makes it feel less like a restaurant) so I trotted up and recited our pick. Given how difficult I’d found choosing, that was probably the point at which I should have asked the staff to make some recommendations, but somehow it didn’t feel appropriate. The service throughout was kind and polite yet oddly shy, in a way that made asking questions feel awkward. So instead I gave the menu my best guess based on a combination of the blurb and Google and sat back down to see what would turn up. I’d gone for a few gambles and a few safe bets, so I figured the worst that could happen was that there were one or two duffers. First to arrive were the two most mainstream things I ordered: chilli paneer and Punjabi samosas. Maybe it’s my conventional taste coming out, but these were my two favourites. 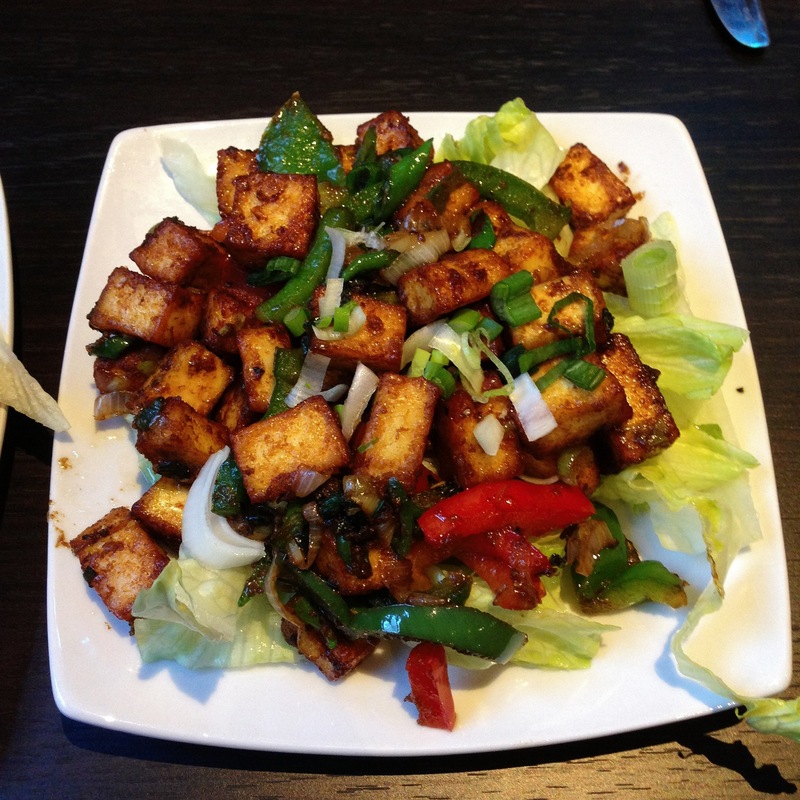 The paneer was just gorgeous – firm, sticky cubes of spicy, slightly salty cheese, cooked with chilli, garlic and fresh peppers which were almost caramelised. Overall the flavour was terrific – sweet, rich, hot but not overpowering. It was served on a bed of pointless lettuce, but you can’t have everything. It reminded me of that bad habit some cafes have – Picnic, for instance – of putting your napkin under your slice of cake, rendering the napkin completely useless (except of course that an iceberg lettuce garnish is even more useless than a napkin, and rarely any more edible). The Punjabi samosas were also very good. It you’re used to rather flat triangles, these were a world away from that – big fat pastry pyramids packed with potato, vegetable and spices. The pastry was crispy and indulgent without being heavy, and the filling had just the right amount of heat. I couldn’t even begin to tell you how they are Punjabi, or how Punjabi they are, but I liked them and that’s what matters. After that we moved into the more unknown reaches of the menu and it became clear that neither the menu nor Google Image Search had quite prepared me for kachori chaat. It’s rather hard to describe, so bear with me. 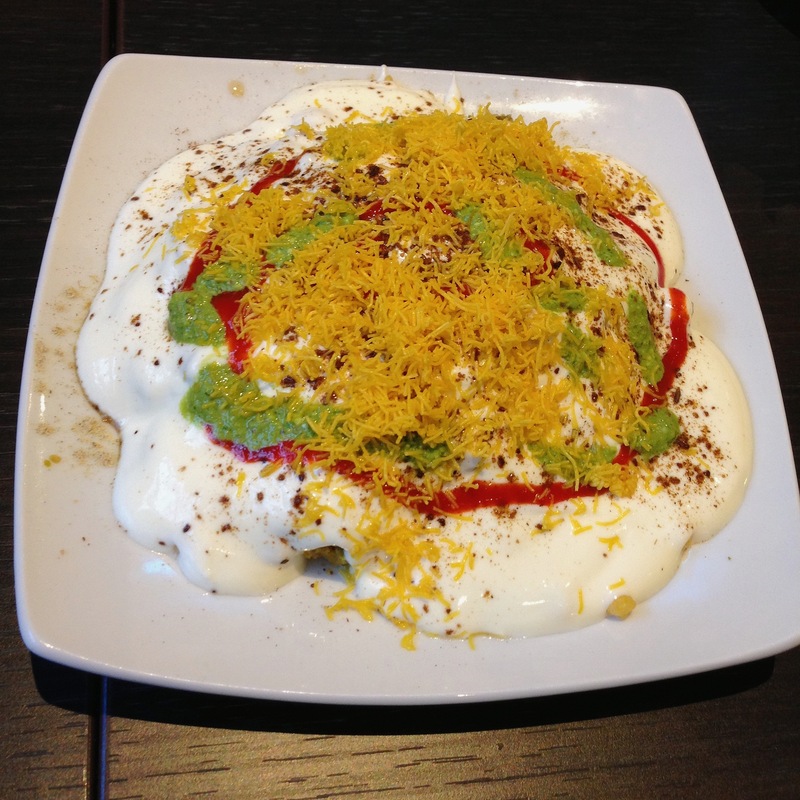 At first sight it seemed that we’d ordered a big plate of yoghurt with very finely shredded bits of Bombay mix on top (this, it turns out, is sev – tiny chickpea noodles). Underneath the yoghurt, I discovered after a bit of claggy exploration with my fork, was a layer of kachori, small round pastries filled with lentils, onions and potatoes. Among all that that I also picked up fresh chopped onions and something crunchy that we couldn’t agree on: was it pomegranate? Was it puffed rice? Neither of us would have put our mortgage on a guess, put it that way. I’m not sure I would even have put my mortgage on knowing whether I liked it or not, because the combination of flavours (simultaneously sweet, tart, tangy and spicy), textures and all that stuff was so different from anything else I’ve eaten in the last year. It was in many ways so alien to what I normally try in restaurants that I felt a little bit as if I’d just eaten the national dish of the Moon. 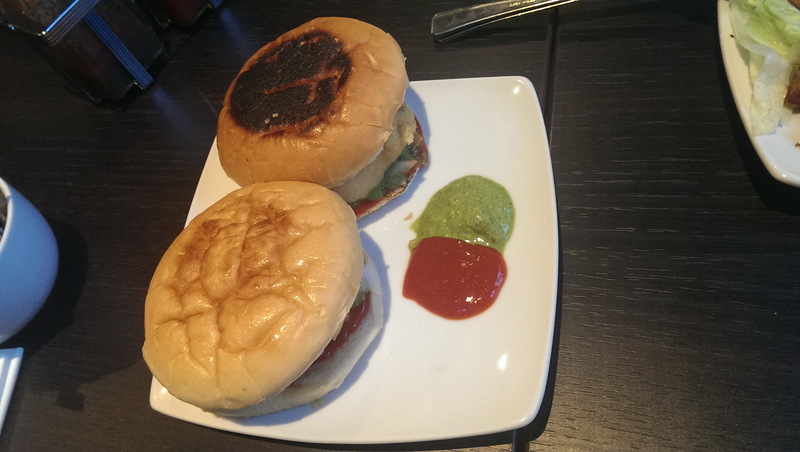 The final pick was vada pav. 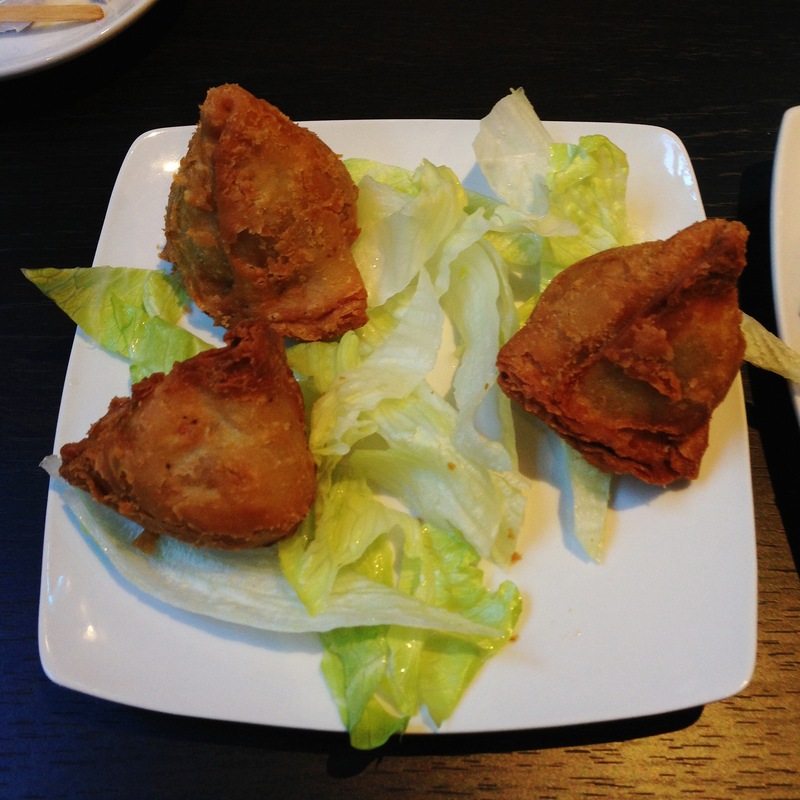 The menu describes it as “spicy potato filling deep fried in a gram flour batter”. I was expecting something resembling a pakora, but what arrived instead looked more like a pair of veggie burgers. The potato was in a soft bun (reminiscent somehow of a McDonalds Filet-O-Fish) and served with two sauces, a green one pungent with coriander and a red one rich with chilli. This goes to show how remiss my Googling was, as every image I’ve subsequently found of vada pav looks exactly like the ones that arrived at my table. Once I’d got over that I found myself liking it, although it would have been nice to be able to feel my face afterwards. Everything else had been so subtly flavoured that I hadn’t quite realised any of my choices would be quite so stonkingly hot (there are no helpful chillies for illustration on the menu, another sign that they presume a degree of prior knowledge). I was glad of the mango lassi I’d ordered by that point – it was delicious but no different, I don’t think, to any mango lassi I’ve had anywhere else. The masala chai was lovely, though I found it odd that it came unsweetened (perhaps this is for the English customers, as it’s normally a rich, sweet and slightly syrupy tea based on past experience). We didn’t stay for dessert – no gulab jamun for me, not this time anyway – but in any case we’d ordered more food than we could comfortably eat (in the name of research, of course). The bill came to twenty-one pounds, but you could easily leave full and spend less. I’ve managed to get through almost the whole review without saying this, but I probably should: I believe, at the time of writing, that Bhel Puri House is currently Reading’s only entirely vegetarian restaurant. It’s the best kind of vegetarian restaurant, where you don’t feel like you’re making a sacrifice and in truth the real sacrifice would be eating somewhere else. You could easily order delicious things off the menu without even noticing, and not once did I find myself thinking This would be so much nicer if only there was some meat in it. I only mention it for all you vegetarians out there, in case you fancy an embarrassment of riches at lunchtime. I could see everything wrong with Bhel Puri House without having to even try: unattractive room, sterile furniture, feels a bit like a cafeteria, strange product display on the counter (is it really plastic tubs full of Bombay mix? Damn. I promised myself I wouldn’t guess) and diffident service. And yet I still liked it a lot. It’s an interesting place: there’s nothing in Reading quite like it. Most people have stopped talking about small plates in restaurants, thank goodness, and yet Bhel Puri House – without fanfare – is offering exactly that, without the eye-watering bills usually associated with those kinds of places. It’s independent and imaginative, an lunch option that offers something completely different, perfect for those times when you don’t want the usual sandwich from the usual suspects but also don’t want to tackle a full meal in the middle of the day. I’ll go back, sans Google, and I’ll pluck up the courage to ask for recommendations next time. I’ll still order the chilli paneer though: just try and stop me. Bart’s closed in February 2018. I’ve left the review up for posterity. I have a lot of sympathy for Bart’s: I visited them in the first week of 2014, one of the deadest times of the year for restaurants. If you’re a restaurant, all your potential customers are either enduring their first few days back in the office or making the most of the last precious time before work can no longer be avoided, still working through leftovers, groaning cupboards and packed fridges. And, of course, lots of your potential customers have resolutions in mind – spend less, eat less, exercise more – and none of those are exactly compatible with eating out. It must be difficult working in a restaurant in early January. Bart’s only had two tables occupied for all the time I was there that evening, and I was at one of them. I bet they were wondering why they’d bothered opening at all. Was eating there similarly difficult? Well, yes and no. Bart’s is a funny place, on the Wokingham Road between Cemetery Junction and Palmer Park. It’s a big restaurant, with a total of three dining rooms, one of which is used for private dining. On the night I visited, the main dining room was almost the only room that was lit, which led to an eerie feeling that you were eating in a restaurant which was only half-open. But the welcome was warm, the other diners (regulars, I think) looked happy and the room itself was comfy and not unattractive. The twinkling fairy lights behind my table lent everything a festive – if hyperactive – glow. The service was lovely throughout: if my waiter was unhappy to be back at work so soon after New Year you would never have known, and he made conversation without sounding phony before leaving us to pick our way through the menu. It wasn’t a menu which filled me with excitement. I showed it to a friend before the visit and she said “that’s the kind of stuff you’d find in a Harvester” and that’s bang on: prawn cocktail, breaded mushrooms, steaks, lamb shanks, burgers, cheesecake and brownies, all present and correct. But that didn’t necessarily mean it would be bad, of course – those dishes are on menus for a reason, and well executed they can be delicious. The wine list is short – a handful of wines by the glass – but all the ones we tried were delicious, and none of them cost more than a fiver. The Corbières was soft, fruity and unchallenging and the Graves was a little more peppery. I had a Chenin Blanc with my main course and that too was very serviceable. Another pleasant surprise came when the waiter brought over a couple of amuse bouches. They were an excellent start: guacamole topped with chives tasted fresher than I expected, and little cubes of chicken liver pate on slivers of Melba toast, along with some caramelised red onion, were also promising. It was the last faultless course I saw from the kitchen, and therein lies the problem with Bart’s. If I was going to describe what they do, I’d say they make some really good food, they make some ordinary food, but the main thing they make are mistakes: too many mistakes, in fact. The starters included the best dish of the night. The ribs were delicious: a reasonable portion, slathered in a sticky barbecue sauce and putting up no resistance to a fork, falling from the bone in meek surrender. I didn’t get much of the advertised paprika in the sauce but it was so delicious that I didn’t care. Even the salad was tasty – properly dressed (with a hint of rapeseed oil, I think) rather than just a pointless adornment. 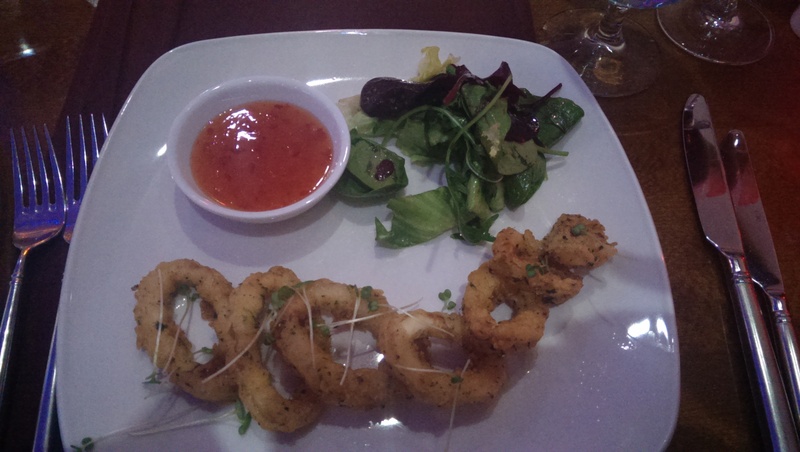 The other starter was a let down – Bart’s describes its calamari as “overnight marinated, dusted in Chef’s special recipe flour and crispy fried”. It didn’t taste as if it had been marinated at all and the coating was nothing special, special recipe flour or no. There are better calamari to be had in many Reading restaurants – London Street Brasserie, Carluccio’s, Jamie’s Italian, even Bill’s – and cheaper calamari to be had almost anywhere. At that price – £8.50 for seven measly rings of squid – I did wonder what was in the marinade. Unicorn tears, perhaps. The mains were also strewn with errors. The sea bream didn’t live up to the promise of the menu because, although the flesh on both generous portions of bream was cooked well, the skin was flaccid, not crispy as advertised. This was off-putting – not just because I love crispy fish skin, but also because it left me wondering exactly how this had been cooked. The mashed potato was meant to contain lemon, but I didn’t get any in what was a giant unfinishable mound of mash. I would have liked more haste, less speed, more lemon, less potato. You can’t go to a grill house and not order a steak, so naturally I did. The twelve ounce sirloin was a gorgeous piece of meat, with very little fat or waste, well marbled and nicely seasoned. 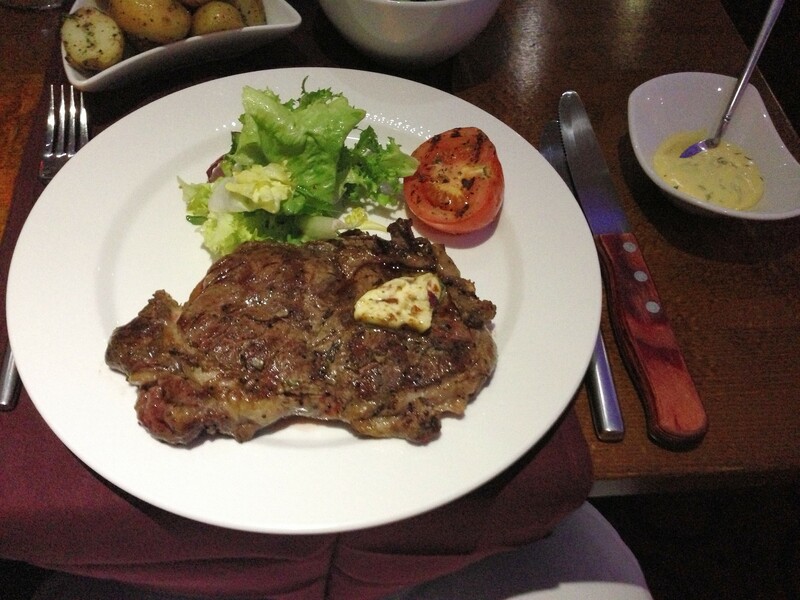 But – and this is an enormous but, in a steak restaurant – it was medium well rather than the medium rare I’d ordered. There’s no excuse for that – especially when the dish is your speciality and the one thing customers should be entitled to expect you to get right time after time. It’s not as if the kitchen was rushed off its feet, either. What I hate most about getting a steak cooked wrong is that it gives you the most unpalatable choice of all: which is more important to you, eating at the same time as your friends or getting the dish you had ordered? To my shame, on this occasion I didn’t send it back, or complain. Maybe I was being charitable because I too had just worked on a day when I’d really rather not and I hadn’t exactly put in my most productive shift either. The side dishes were a collection of mistakes expressed through the medium of vegetables. Sautéed potatoes weren’t anything of the kind, just baby new potatoes boiled and then flashed in the pan to have colour but no texture. Steamed broccoli with almond flakes were exactly that and nothing more. If the flakes had been toasted and the broccoli had been tossed in a little butter it might have been interesting, but as it was it was just florets, nuts and a strong sense of being underwhelmed. If we’d left then, and we nearly did, this would have been a different review. But, against all odds, Bart’s redeemed itself through its desserts, which were extraordinary. Warm caramelised rice pudding with sautéed mixed berries was divine – a deep pot of creamy rice pudding with a middle later of something like a berry jam. 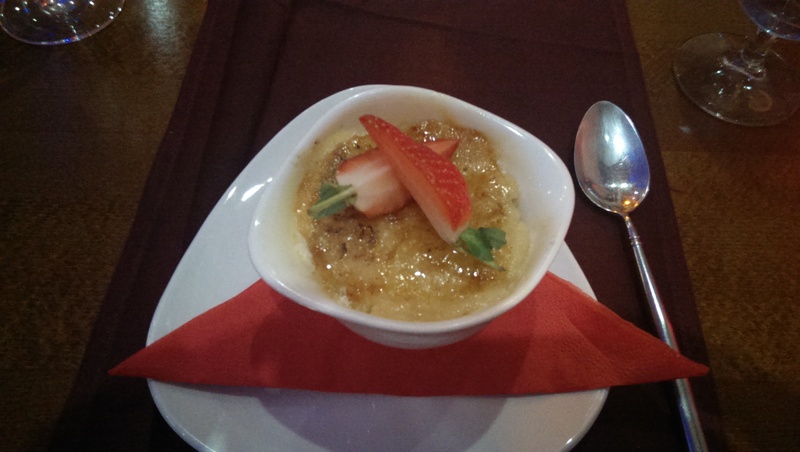 On the top was a nicely bruleéd layer of sugar which gave a fabulous toffee taste to the rice pudding. The other dish was recommended by the waiter. Poached pear in almond soup sounded interesting on paper, and more adventurous than most of the dishes on the menu. When it turned up it was glorious. 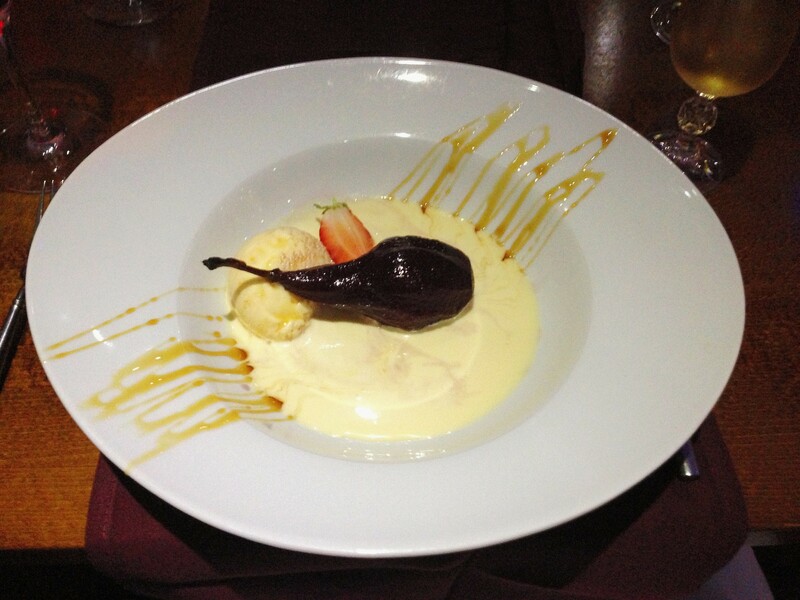 The pear – although not huge – was soft, dark and delicious with the red wine and port it had been poached in. The “almond soup” was probably better described as liquid marzipan, creamy, grainy and sweet. I complimented the waiter on it and he told me that the soup was the chef’s own creation – and he looked proud on his behalf. One last mistake though, because it was too asking too much to expect Bart’s not to make one: the supposedly cinnamon ice cream, which would have been perfect, was plain old vanilla. At the end of the meal the manager came over and asked us if we’d liked the meal. Slightly won over by the desserts and the superb service we said yes, at which point he brought over a couple of complimentary nightcaps and a form for us to fill out to get a loyalty card. I was a bit fuzzy on the details by then but it seems like you can become a member to enjoy various undisclosed benefits (I didn’t sign up, so I’m afraid I’ll never find out what they are), as well as twenty per cent off your next bill. Our bill was a hundred pounds, including service, for two people, three courses each and five glasses of wine, and I thought that was okay but not amazing. I’ve thought about the meal at Bart’s a lot and I still can’t quite make up my mind about it. You can probably tell. 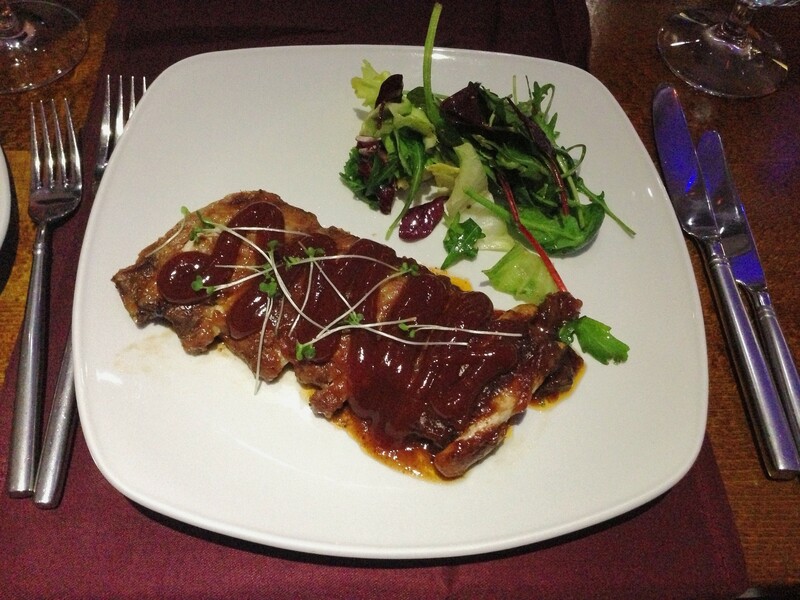 Some of the food was really good, the wine was great, it was a nice cosy room and the service was excellent. But there were so many mistakes, all over the place, from the minor to the major to the fundamental. A steak house that can’t cook steaks as ordered is getting the basics wrong, and no personable greeting when you arrive is ever going to make up for that. 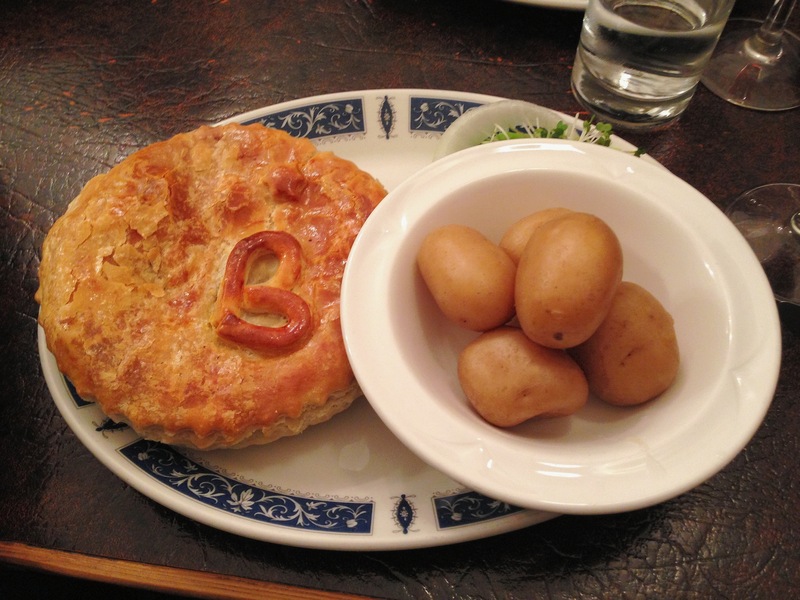 I wasn’t expecting great things from Bart’s – I walked down the King’s Road with a growing sense of dread – but in the end, even though it wasn’t a brilliant meal, there were plenty of surprises. I wasn’t expecting the best of their food to be as good as it was, or for the service to be so good. What I really wasn’t expecting, though, was to come away from it disappointed that I couldn’t rate them more than I do. Maybe they were just having a bad day at the office and suffering from New Year blues, just like I was, and I can’t rule out going back later in the year to see if they can do better. But going three times in fifteen months, like the local paper did? No. Not unless you paid me.